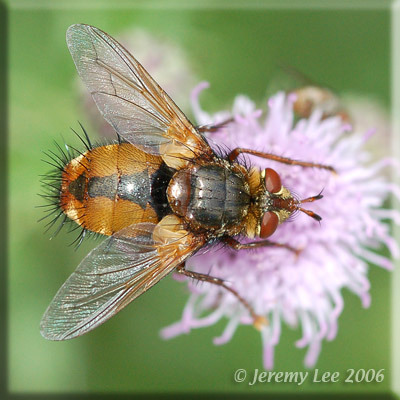 Tachina fera, more commonly known as a Tachinid Fly, is a very common large (9-16mm) and bristly fly with a prominent broad black stripe down the centre of an otherwise orange abdomen. It can often be seen in moist and well vegetated locations where it feeds on umbellifers and waterside plants during May to September. The larvae are parasites of caterpillars and other young insects. Common and widespread in England and Wales.